Around 100,000 children attend special schools in England, including the majority of children with severe learning disabilities or autism. SeeAbility’s study indicates that up to half of these children are likely to have a problem with their vision, yet an estimated 40,000 children will have never received any eye care. Thousands of children who need glasses are going without, many suffering extremely poor vision without anyone knowing about it, impacting their ability to learn, play and socialise. While others with more serious eye conditions are being deprived of sight-saving treatment. SeeAbility is calling on NHS England to make wide reforms to community eye care for children and adults with learning disabilities and introduce adjusted eye tests in special schools. Failure to target these high-risk children is causing unnecessary vision impairment and putting their eye sight at risk. Nearly half (47.5 per cent) had a problem with their vision. A third (31.7 per cent) needed glasses. Over four in ten (43.7 per cent) had no history of any eye care. Of those children with a sight problem, more than a quarter (28 per cent) had a problem that was previously unknown to school or their parents. All children in England are entitled to have a free NHS annual eye test. However, children with learning disabilities are often unable to access or cope with standard eye tests provided in high street opticians or in a hospital clinic. Many parents of children with learning disabilities are unaware of the increased likelihood of sight problems for their child. Those who are aware are often at a loss to know where to take their child for an eye test they can cope with. Children who have severe learning disabilities or autism which make communicating or interacting difficult can still have an eye test if adjustments are made. It’s a common misconception that the ability to read a letter chart is necessary or that a child needs to be able to speak to have their eyesight tested. 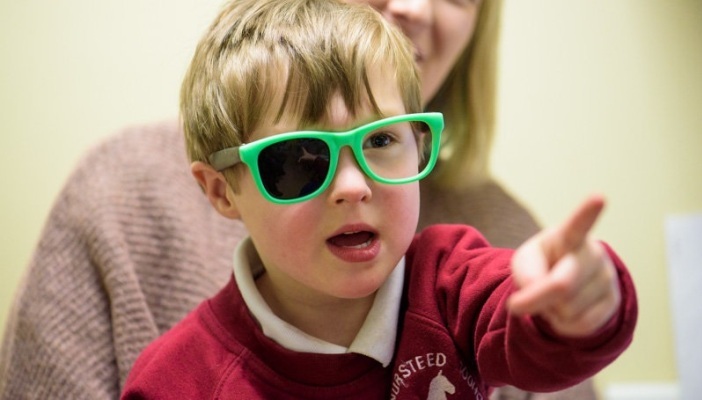 SeeAbility’s model of sight testing in special schools, recommended by eye care professional bodies, could help reduce the use of under pressure hospital eye clinics, which some of these children are attending because of a lack of a community alternative. It often works better for children with learning disabilities as it's less stressful, reduces time they miss from school and incorporates glasses dispensing and repairs for broken spectacles. The full findings are in SeeAbility’s fourth-year report, Children in Focus – a clear call to action, published as part of SeeAbility’s Equal Right to Sight campaign.